Today was a very special morning. After all, so much have happened and changed in last 24 hours. Yes – election results are out. India has spoken – loud and clear. After yesterday's dream election results, sleep was sweeter and morning was calmer. Though there is a sudden loss of anxiety and curiosity, which has been replaced with a sense of fulfillment. This is the exact vacuum you would have felt after finishing your last exam of engineering. Life has a strange and at times, surprising way to payback. Exactly 5 years ago, on 17th May 2009, I was writing my thoughts with a heavy heart and disappointed mind after election results were out. Today, 5 years down the line, exactly on the same date (17th May), I am writing this post with a sense of fulfillment and joy. In fact, I am not able to stop smiling since over 45 hours, when initial trends started pointing towards a historical win for the BJP and NaMo. Last 45 hours were filled with tremendous joy, a sense of disbelief, uninterrupted FB updates, phone calls to friends and families, screaming, punching in air, talking endlessly with like minded people and just enjoying each and every moment! Without any doubt, we must applaud India’s voters, who raised about cast and creed and overwhelmingly poured their love and trust on NaMo. What we must appreciated is voters sense of judgement to mark a clear difference between local elections Vs national elections and voted accordingly. Hats off! Take a bow! Last evening, I loved NaMo's speech at Ahmedabad – especially his reference to not limiting himself to just one term but ensuring repeated terms. That is exactly what he did in Gujarat and that is exactly what we need for this nation. While NaMo can bring life to a dead body with his inspirational words and actions, our current (or previous, whatever) Prime Minister Dr. Singh had an ability to turn a living being in almost as useless as a dead body with his utterly uninspiring speech, body language and leadership style. We surely need a leader who can inspire. Who can lead. Who can involve people in nation building and who can bring a sense of pride in each and every citizen. We need to build a nation which is confident, capable and can look at the word – eye to eye. That starts with the leadership and for a change, we have got it. The biggest democracy in the world has arrived. ©Except cartoon, all rights reserved with Mihir Rawal. To re-print or re-use, prior permission is required from the author. Aha! Just less than a week to go! After all, this is the day I was waiting for ever since 2009 general election results were declared. I checked my blog and here is what I had written way back in 2009 : http://www.mihironline.com/2009/05/enigma-called-indian-democracy.html. Incidentally, 2009 results also came on 16th May. Election results came as a cropper and beyond expectations of all political pundits as well as most of common men. The scariest part after the result was the prospect of an Italian origin lady ruling over a billion people. It almost became a reality but thanks to Dr. Kalam and Dr. Subramaniam Swamy, it didn’t materialize (There is no direct proof but most of the stories revolving around “sacrifice” of SG leads to Swamy and Kalam). Thankfully, at least and last, an Indian became the PM – though more or less handicap and as Sanjaya Baru’s latest book “The Accidental Prime Minister” reveals, working under Italian influence. Results were disappointing. Waiting game started for next 5 years. It was an even bigger surprise defying logic! I mean no common sense could justify Congress (I) getting over 200 seats! Beyond all sane logic! I was sheer disappointed but alas, there is no other option when over a billion people decide to vote based on either freebies or gimmicks or Gandhi surname. Life goes on. Wait goes on. Flashback over. Back to present. This is the year that has an opportunity to correct a lot of mistakes of last 10 years. First time, someone has openly challenged the dynasty, someone has openly expressed his desire to become the PM and someone is talking about issues and solutions, that vibes with the common men. Being a Gujarati, I have known (though not personally) NaMo since 1980s, when he brought BJP in power in Ahmedabad municipal corporation. He was the master organizer behind Ram Rath Yatra in 1989. He played an instrumental part in Ekta Yatra which concluded by waving the Tricolor at the Lal chowk of Srinagar, at the height of insurgency in 1992. Again, he was the mastermind to bring BJP in power in Gujarat in 1995. He had to leave Gujarat due to internal differences among BJP leaders but then he moved to Himachal Pradesh and brought BJP in power there as well. For Gujaratis, there is a special bonding with NaMo. Most of us do not see him as the CM but as someone who is part of the family. Who is our own man. Over the years, he has earned it. For this election, there has been a tremendous enthusiasm all around nation – which is quite surprising and a welcome move. Exceeding high voting percentage, berserk TV channels (some might be flooding paid news), a very active social media, very active and animated discussions even inside office space, whatsapp messages.. it looks like life has been engulfed by politics since last couple of months. I like it. Because unless a common man talks and discusses about politics, unless (s)he takes an active interest in current affairs, we will continue to live the way we have been since decades. In my own experience, I went to vote at 6.55am and I found around 150 people were already standing in a queue! Aha! Though I had to wait for an hour to vote, I loved it! The only pitfall of this election is exceedingly high expectations, even higher than the Mount Everest. Well, past 10 years of misrule has brought such a high level of frustration that whoever next comes to power, will have a mountain to climb – that too in a very short time. This country has umpteen complex problems and a lot of them are related with selfish motives of individuals or groups or parties. On the other hand, public perception in India is very short lived. Patience has died down. Everyone wants a quick fix. Hope NaMo can set and manage right expectations. 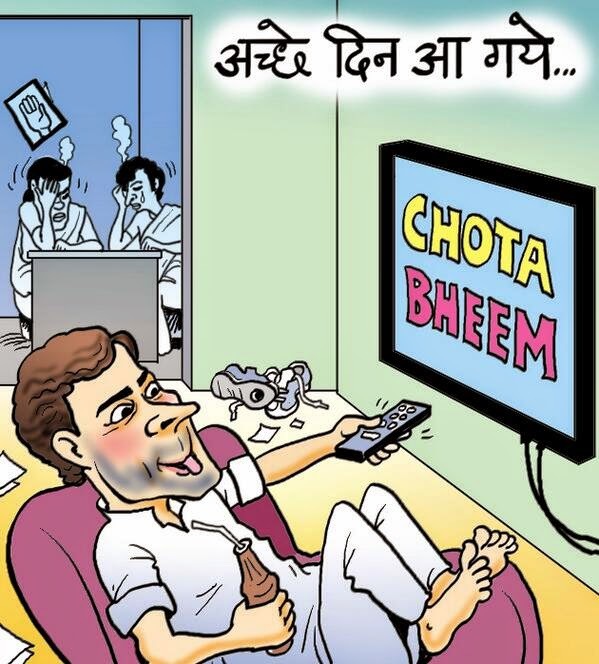 If he fails this time for any reason, it will have a long lasting impact on Indian politics. After all, hope comes in form of a ray and if that ray fails, it may be difficult for the nation to hope and trust any individual once again. Nobody knows better than people of Delhi - After their failed experiment with AAP. Let us pray god let the best thing happen to this great nation. Ending with this universal Shanti Mantra. May all see what is auspicious, May no one suffers in their life. Just like any other day, I got up at 6am and was ready to go out for morning walk at 6.30am. However as it had rained last night and it was a cloudy morning, I hesitated for a minute to decide – to go or not to go. The decision was a go. Then I opted to take a car to drive down to Botanical Garden rather than usual bike ride. Botanical garden has this beautiful 3km trail. It has an entry and exit but no other exit route in between 3km long trail. I usually take two rounds, which is a good 6km walk. 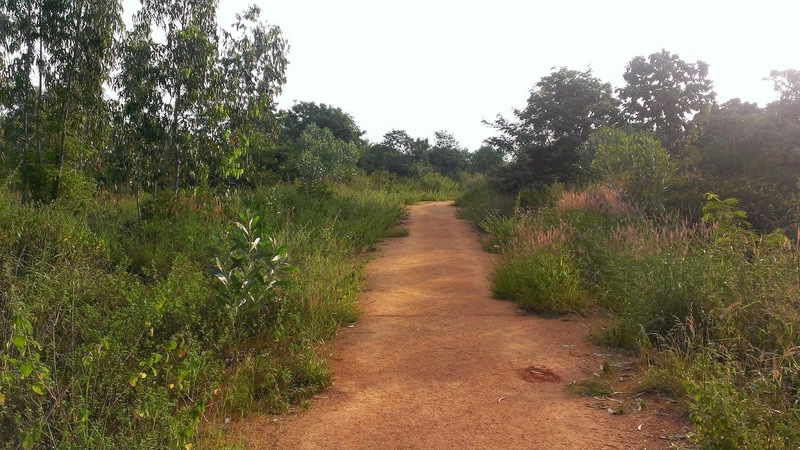 This walk is beautiful as it has rare chirping sound of birds, especially peacocks. 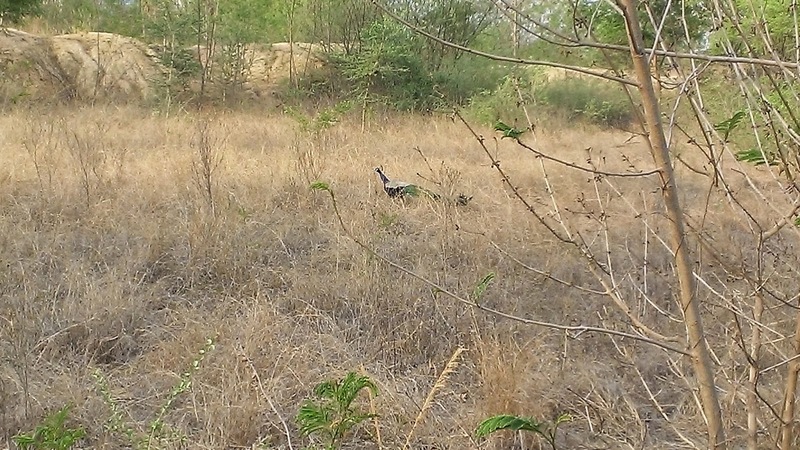 In fact spotting a peacock is quite normal and sometimes, you see them crossing the trail, just few feet away from you. Today, crowd was sporadic – considering it was cloudy and potential to rain. Now I cherish this one hour the most out of 24 hours that god has provided. I usually listen to classical music from Pandit Bhimsen Joshi or Pandit Jasraj. Sometimes I hook up to ancient Sanskrit Mantras and off late, I have downloaded wonderful commentary on Shrimad Bhagwatgita (There shall be a separate post on that). Today, while I was on my way to complete first 3km, it started drizzling. Very mild though. I continued my walk in company of Shrimad Bhagwatgita. While I was about to reach towards the end of 3km trail, again I had a decision to make – to walk for another 3km (considering it might rain) or to halt and come back home. Again, the decision was a go. I turned back and started my next 3km walk. I walked about 1km and then it started to rain. Or say drizzle turned from mild to heavy and then heavier. Body started getting wet and within no time, it was completely drenched. Though I saw few other walkers started running, I didn't run. I just decided to continue walking at my usual speed. Well I was just hoping Bluetooth headset will not get damaged in rain but who cares, I just continued listening to Gita and walking in rain. Slowly the entire experience turned from just getting wet in rain to something special. A wonderful trail, peacocks sounding all around and their intensity only increasing with increasing intensity of rain, soulful commentary about life and a wet body receiving nectar from above. It felt as if it is god’s way of cleansing. Not just the body but mind and soul. I just kept on walking feeling each drop of water falling on my body like a blessing from god. My shoes were dirty, body was wet but mind was at peace and soul felt happiness. It was such an amazing experience which is difficult to describe just through words. I so wanted this walk to continue forever, eternally. Alas, came the end. I headed back to my car. However I just didn’t want to get in the car. I stood there outside the car for a few more minutes. Completely in silence. Looking up in the sky.